Successful candidates of the new the DevOps Practitioner® role-based course will earn the DevSecOps Engineer certification. 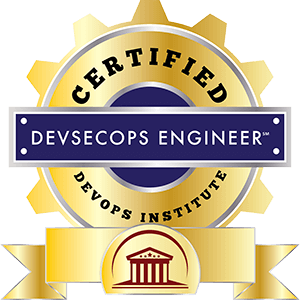 BOCA RATON, FLA. (PRWEB) APRIL 25, 2018–The DevOps Institute (DOI), the Continuous Learning Community around emerging DevOps practices, and New Context, a Lean Security company that automates the orchestration, governance, and protection of the Industrial Internet, today announced the launch of the DevSecOps Engineering course and industry certification. as part of The DevOps Practitioner® certifications. This unique course explains how DevOps security practices differ from other security approaches and provides the education needed for IT professionals to understand and apply data and security sciences. This certification is delivered by DOI’s global channel of Registered Education Partners. The DSOE certification course was authored in partnership with New Context Vice President of Product Andrew Storms (@st0rmz). Storms is a well-respected information security, cloud, DevOps, and secure agile development professional. Storms designed the course around the purpose, benefits, concepts, and vocabulary of DevSecOps. In particular, how DevSecOps roles fit within a DevOps culture and organization. For more information, visit the DevOps Institute website. New Context protects data and the movement of data in highly regulated industries. Our Lean Security methodology integrates security into software development, critical infrastructure and architecture. New Context is developing a singular design pattern that unifies the latest solutions in automation, AI, blockchain and biometrics, and partners with the leaders in government and industry. We’re passionate about keeping the connected world safe. New Context HQ is in San Francisco. The DevOps Institute is the continuous learning community around emerging DevOps practices. Working with recognized thought leaders, the DevOps Institute is setting the quality standard for DevOps competency-based education and qualifications.